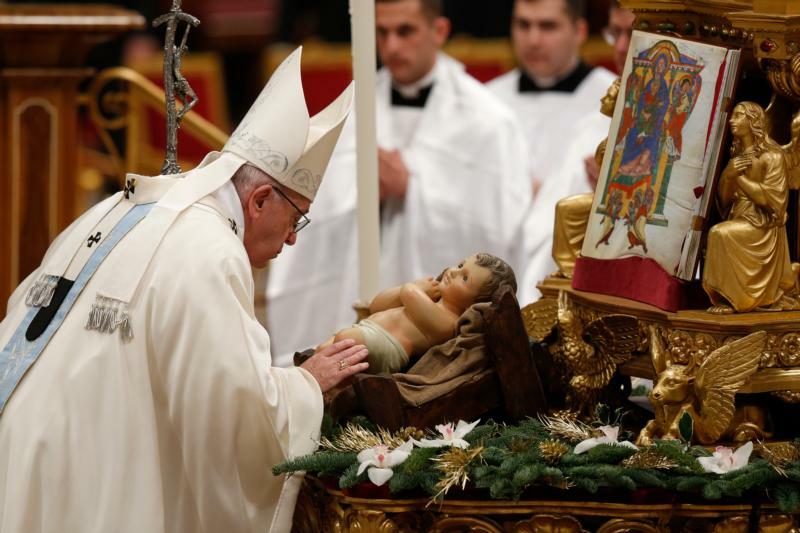 VATICAN CITY (CNS) — Pope Francis has a full schedule of Christmastime liturgies planned for December and January, including the customary baptism of newborn babies Jan. 13, the feast of the Baptism of the Lord. The Vatican published the pope’s Christmas schedule Dec. 10, reconfirming liturgies originally announced in late October. — Dec. 24 at 9:30 p.m., the Christmas Mass in St. Peter’s Basilica. — Dec. 25 at noon, Christmas message and blessing “urbi et orbi” (“to the city and the world”) from the central balcony of St. Peter’s Basilica. — Dec. 31 at 5 p.m., first vespers for the feast of Mary, Mother of God, followed by eucharistic exposition, the singing of the “Te Deum” hymn of praise in thanksgiving for the year that is ending and benediction. — Jan. 1 at 10 a.m. in St. Peter’s Basilica, Mass for the feast of Mary, Mother of God, and for the World Day of Peace. — Jan. 6 at 10 a.m., Mass in St. Peter’s Basilica for the feast of the Epiphany. Earlier, the Vatican had announced that on the feast of the Baptism of the Lord, Jan. 13, Pope Francis would celebrate a morning Mass in the Sistine Chapel and baptize infants. He is scheduled to travel to Panama Jan. 23-28 for World Youth Day.